Mornings start early up here in the north Georgia mountains. I usually get up when Lloyd does, around five or five thirty most days. I like to have my first cup of tea while it’s still dark outside and quiet inside. My husband is a hard worker and a good provider for our family. Things are rough for so many people these days, I can’t complain. We made it through 1934, and I just know the good Lord is going to see us through 1935, too. This morning, Lloyd and I are going into town to pick up our spring seed order at Wilson’s Feed and Seed. Sure hope we have a good crop this spring and summer. I plan to can even more than I did last year. With three big, strapping boys, I can hardly cook enough to keep them full these days. The two girls just pick at their food, but that’s a girl for you. The boys, though, I’ll swanee, I can hardly cook it fast enough for them. Yesterday at breakfast, I thought Zeb and Eddie and Richard were going to fight over that last biscuit. Those three worry me. They love to read about the war and all the things that happened in Europe not so long ago. Zeb says he’d love to go overseas and fight for this country. I’m just glad my boys are too young to be involved in anything like that. I hope there won’t ever be another war. While Lloyd and I are gone to town, Myrtle and Louise will give a good cleaning to the kitchen. The cabinets smell like bacon grease, and I don’t like that one bit. Besides, we ought to tidy up some since I’m about to bring some nice new dishes into this house. Lloyd and I have never been what you might call fancy people. We’re just plain folks. But I do like for things to look nice. I like for my pound cakes to turn out pretty, and I like my biscuits to be nice and uniform, cut out perfectly round with the biscuit cutter. Thanks to Lloyd—and the chickens, of course—my kitchen’s about to look even nicer, because I’m headed to pick up the prettiest set of blue dishes I’ve ever laid eyes on. Wilson’s Feed and Seed is next to Alley Brothers Dry Goods, and on trips to town I always go in Alley’s to pick up provisions. Sometimes it’s a bag of flour, sometimes it’s buttons, or maybe it’s some thread if I’ve been patching up the boys’ jeans. One day, I was in Alley’s when a salesman stopped by with these beautiful blue dishes. The pattern was called “Silverdale,” and it was made by a company called Swinnertons way over in London, England. “Silverdale” is such a pretty name. I told that salesman I had no need for pretty dishes like that here on the farm. Why, the boys would bang them up in no time, and there I’d be, with a bunch of chipped and cracked dishes on my hands. At least, that’s what I told Lloyd when we left the store that day. When we got home, Lloyd said, “Helen, you’ve been talking ’bout them dishes all morning. You liked ’em, didn’t ya?” I hadn’t even realized I’d been going on about them. Goodness knows I didn’t want Lloyd thinking I was hankering for a set of dishes, of all crazy things. Times are hard enough without us wasting hard-earned money on anything that isn’t a necessity. “No, Lloyd. They were pretty is all. But I have no need for such as that.” I remember that Lloyd just nodded. And that, I thought, was that. The next time Lloyd went into town, he came back with a sales ticket from Alley Brothers Dry Goods. “Here,” he said, handing me the ticket. That was six months ago. Little by little, I’ve been watching that egg money grow. Neighbors who don’t have chickens have bought my eggs for years, and I’ve saved a tidy little sum thanks to those eggs. Now, every time those chickens lay an egg, I could just about kiss ’em, just thinking about how pretty those new dishes will look in my kitchen. The boys, by the way, won’t be using them. Lloyd and I agree on that. I’ll use them when my sisters stop by for a cup of tea or coffee, or when the preacher’s wife comes in for a visit. I might even sew up some napkins and get the girls to embroider daisies on them. The old grandfather clock in the corner shows that it’s nearly nine o’clock now, and I can’t believe I’m soon going to be drinking my morning cup of tea out of a brand new cup that came all the way across the ocean from London, England. I’ve tried not to act too excited about it, even though it’s not every day something so nice comes into this house. “Helen, you ready to head into town in a bit?” Lloyd calls from the porch. He’s been giving the boys their chores for the day. I wipe down the kitchen counter and set my old, stained ironstone cup upside down on the draining rack. “Yes, Lloyd, I’m ready,” I say. After drying my hands on the dish towel, I untie my apron, gather my pocketbook, and reach for my old blue hat. It’s time to bring my new dishes home. How long does tea keep? After a week of wrestling with exactly *how* honest I should be on this blog, I decided to go for it. You see, last week, I found in my kitchen cabinets an old pouch of tea that I had forgotten I had. 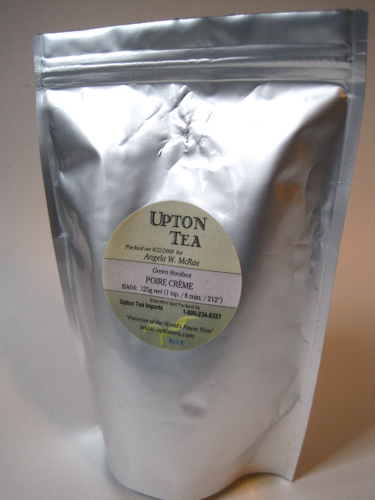 But as happens every now and then, it was time to clean out the spice cabinet, and tucked way up in a corner behind some other goodies was this 125 gram bag of Upton's Poire Creme (pear cream) green rooibos tea. Now I absolutely love this tea, so I can't imagine a) why I stored it where I wouldn't see it and b) how I could have so easily forgotten about a favorite blend. But here's the thing: Upton dates their bags, so with a gulp, I realized exactly how long I've had this bag of tea, and it's downright embarrassing. I was just about to toss the bag out when, out of curiosity, I opened it to see if it had any scent left. To my great surprise, the tea smelled rich and fresh, not musty or stale at all. Naturally, that meant I had to steep some of the tea and taste it. 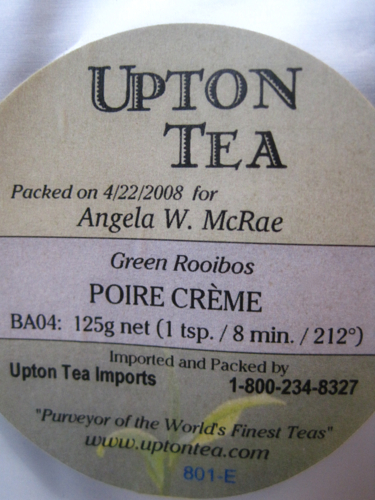 Again to my surprise, this green rooibos still tastes just terrific. Now I do not by any stretch advocate hanging on to tea for this long, and I can't imagine very many teas would even last this long, but I had to share about my forgotten bag of tea. Perhaps it helps that it was in a dark place for so long? 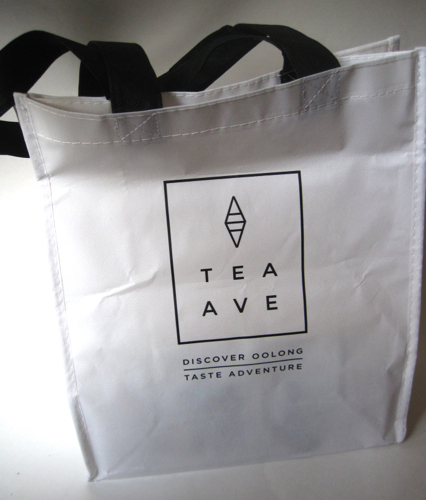 What's the longest you've kept a bag or box of tea that was still drinkable? I would've probably said "two years, max" if I hadn't found this one! 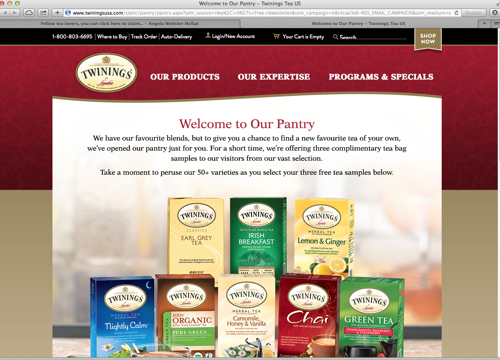 Act fast: Twinings is offering free tea samples! 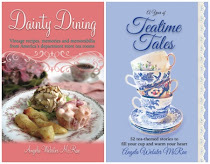 I am posting this "Thursday" blog post early because I just saw something on the Afternoon Tea Across America Facebook page that is worth sharing immediately: Twinings is offering three samples of their tea bags, completely free! I've already ordered mine, and I hope some of you will take advantage of this freebie as well! I have no idea how long this offer will last, so I'd certainly encourage you to act now. Click here to order your free tea samples! 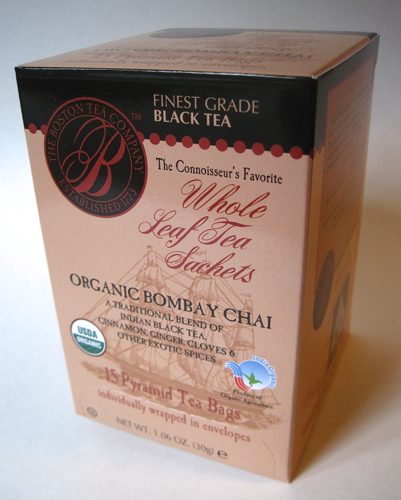 The graphic on the box caught my attention because it features a tea ship, and of course that also reminds many of us here in America of the Boston Tea Party, the inspiration for this tea company. 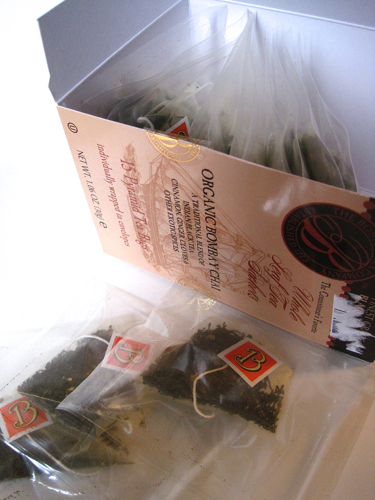 When I opened the box, I was pleasantly surprised to find that these tea sachets are individually wrapped. Only a few other tea vendors seem to do this with their tea sachets (Harney comes to mind), so I was delighted to find that this tasty new tea is also one I might be able to share with a few friends—just as a tea friend originally shared it with me! 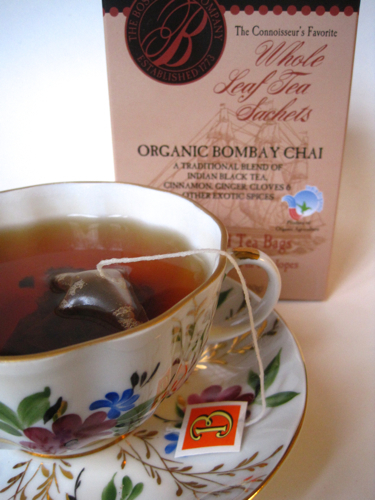 Have you tried tea from the Boston Tea Company before? If so, which one(s) do you recommend? 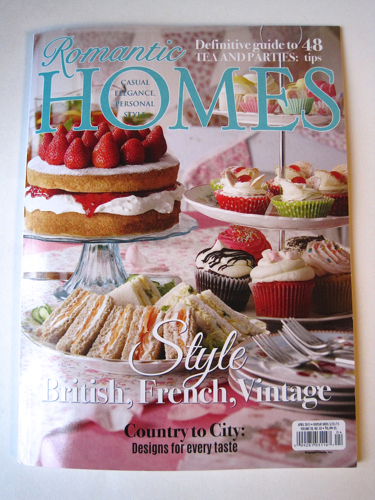 Any magazine with a cover depicting teatime catches my attention, so I had to check out this April 2015 issue of Romantic Homes. 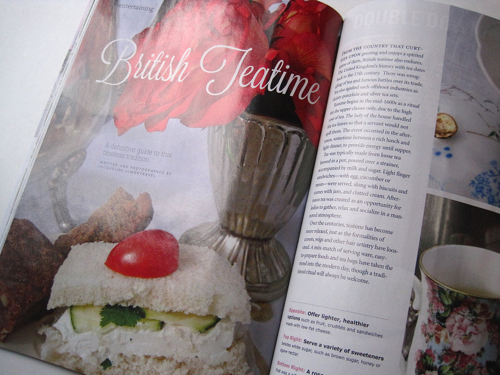 This issue also has pages and pages of new teas and teawares (I ordered something on this page that I hope to share with you soon), so it's definitely an issue worth checking out if you're a tea lover! My aunt and I shopped our hearts out on Saturday but came up empty-handed. We found nothing at the thrift stores. Or T.J. Maxx. Or Ross. Or Beall's. Finally, we decided we'd stop by an antique mall in Bremen we like to visit every now and then, and I was happy to find several teapots that were very reasonably priced. Saturday was cold and gray and rainy here, so by the time I spotted this teapot, I decided some spring-like roses were in order. I've seen teapots of this style before, with panels described as "trellis" or "basketweave" in design, but I've never had one. I thought $14.99 was a great price for a nice big teapot, and I was happy my day of shopping ended up being fruitful after all. 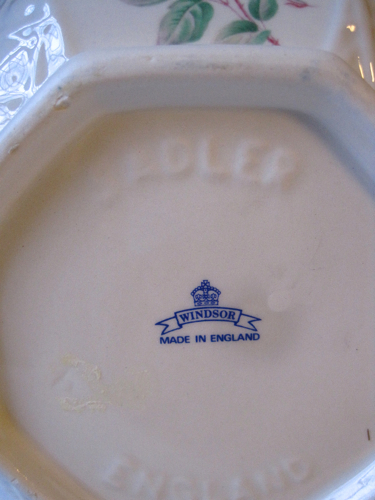 I was also intrigued by the fact this teapot is embossed "Sadler" but also has a backstamp reading "Windsor." 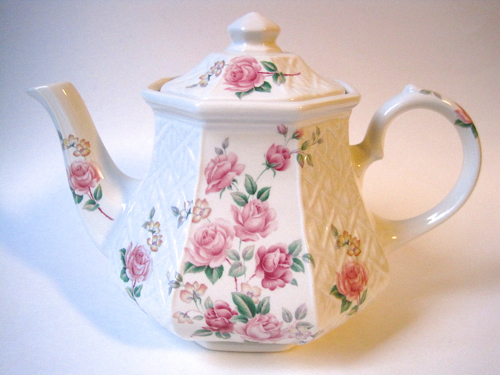 So is it Windsor-Sadler, Windsor for Sadler, a Sadler-style teapot with design by Windsor? I looked online but couldn't really find anything helpful on the topic, so if any of you know, I'd love to hear what, precisely, this combination of marks means. And on a semi-related note … in the course of my online search about backstamps, I came across a post I thought was most intriguing. If you click here, you can see some neat photos from The Potteries in England showing how handles are applied to teacups. While I haven't given a ton of thought to this topic, I must tell you I found this process simply fascinating! Susan and Marleen had two o’clock reservations at the Wisdom Tea House, the new tearoom downtown. Susan was eager to try it out, but Marleen wasn’t so sure. This tearoom offered a “contemporary” tea experience, and Marleen feared it would be one of those hippie tea rooms she’d read about, one where middle-aged ladies wearing crystals and Birkenstocks came to plan their peace rallies. Marleen vastly preferred the English afternoon tea experience. She liked seeing English bone china and perhaps some doilies on the table and vintage hats on the wall. Susan, however, was weary of those pink-and-chintz tearooms and eager to try something new. The moment they entered Wisdom Tea House, Susan’s eyes lit up. Finally! Susan loved drinking tea, especially Japanese greens, but she wasn’t into the little-old-ladies-and-white-gloves mind-set. This tearoom seemed designed for modern sensibilities. As they were seated, Marleen tried to conceal her disappointment. 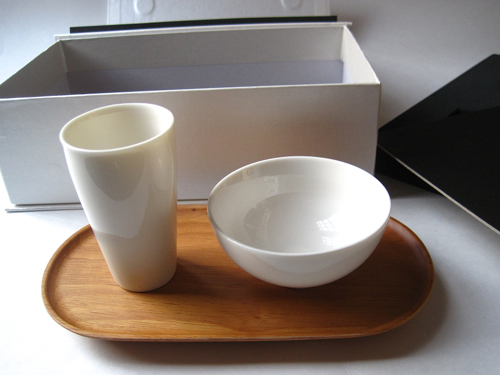 Everything was so simple and stark, with plain white cups and saucers before them, no rose-patterned china in sight. A young woman in black slacks and a white blouse approached to take their tea order. Marleen tried not to be distracted by the blue streak in their server’s jet-black hair. Caitlyn was the young woman’s name, and Susan asked Caitlyn which green teas she recommended. “Are you familiar with Japanese greens?” Caitlyn asked. “And you, ma’am?” Caitlyn asked Marleen. “I’ll have the English Rose tea,” she replied. “Good choice,” said Caitlyn, surprising her. “Some people find the rose taste too perfumey, but I’ve always loved it myself. With a nod of her head, she was off, and Susan and Marleen studied the rectangular ivory menus featuring a graphic of two leaves and a bud. “Why not?” said Marleen, trying to get into the spirit of the place. The server had encouraged her by actually liking the rose-flavored tea. When their tea arrived, Marleen noticed that Caitlyn placed each small brown earthenware teapot onto a beautifully quilted and padded fabric square. “How lovely,” she said. Marleen had quilted for years, and needlework always caught her eye. Soon the first course appeared, and the two friends couldn’t wait to start enjoying it. “Our quiche today is a vegetarian asparagus quiche. If you need any refills on your tea, just let me know,” Caitlyn said. Both women still had plenty of tea, so they tucked into their quiche slices with great gusto. “This is divine,” said Marleen. Next came a black wrought-iron stand containing their savories, scones, and sweets. There was a beautiful array of foods that included turkey and arugula finger sandwiches, curry chicken salad bites rolled in almonds, plain and hazelnut scones, and scrumptious dessert offerings that had them both drooling. Susan reached for a sandwich, and Marleen sat admiring it all. By the time they’d polished off the last scone, Marleen was stuffed. She ate a bite of an apricot square and half a white chocolate truffle before announcing she was done. Caitlyn brought her a box for the leftovers. In the gift shop, Marleen looked around to make sure Susan couldn’t see her handing over a check and hear her telling Caitlyn, “Please add this to the fund for those girls in India. I love that you support education in this way.” Marleen pondered the fact she’d been quite wrong about this “hippie” tea room. She was so glad they’d come. As they left the Wisdom Tea House, a young college student wearing a Grateful Dead T-shirt and jeans entered, her ragged gray backpack hanging off one arm. 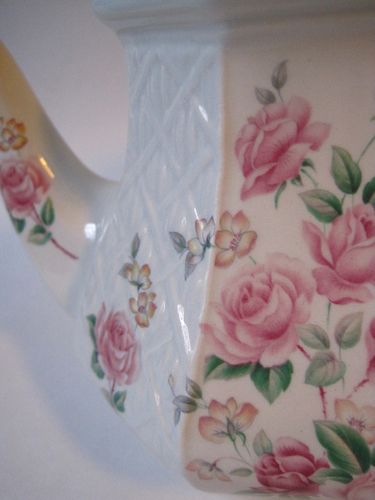 She glanced at Marleen’s decorative pink jacket with teapot appliques on it. Just the sort of woman I expected to find here, she thought. The young woman requested a table and sat down before unzipping her backpack, pulling out her laptop, and opening it. “I usually drink oolongs,” said the young woman, fully expecting the tea choices to be Tetley and Lipton. Back in 2007, my tea jewelry wardrobe got a wonderful upgrade when I attended the World Tea Expo in Atlanta and found the booth of Dee Sharp, whose many beautiful tea-themed jewelry creations were on display. 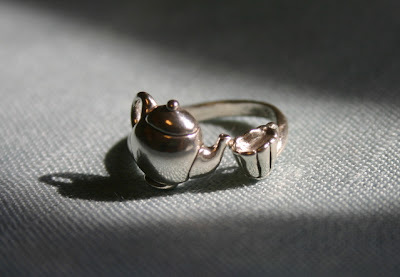 This sterling silver teapot and teacup ring I bought from her is one I treasure, and I was very fortunate that I was directed to go there by "Tea Lover Denise," a fellow tea blogger back then. 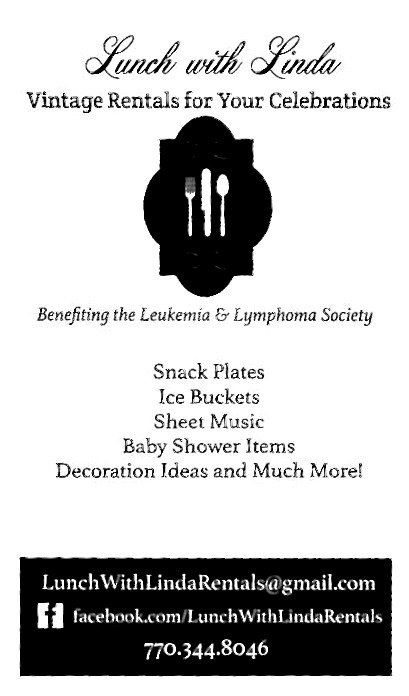 This week, I received the sad news from Dee's friend Theresa that Dee passed away this week from acute leukemia. Having lost my own mom to cancer, I am well acquainted with this despicable disease, so my heart hurts for those Dee has left behind, including her friend, who was so kind to let me know of her passing. For those of you who remember Dee, you can click here to read about her background in jewelry making. I'm so sorry to hear she's passed, and yet I can't help thinking how lovely it is that she left her gracious "mark" on the world—quite literally. Kind of makes me think about what kind of "mark" I wish to leave behind! RIP, Dee Sharp—and thank you. 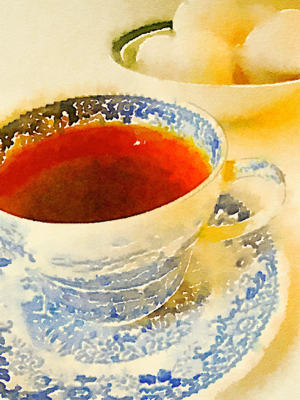 Do you know which authors preferred tea? My husband knows I enjoy reading all kinds of trivia about writers, and he shared an infographic with me this week that I thought was well worth sharing here. 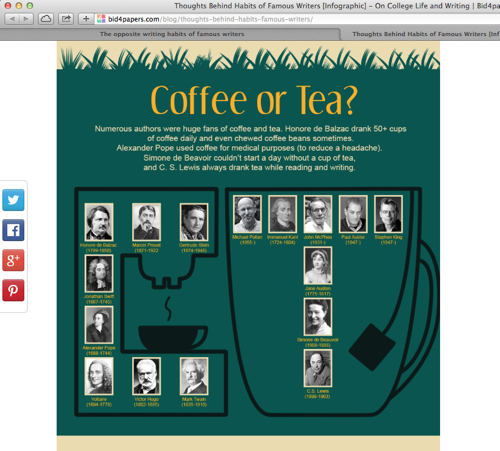 Above is a screen grab of the essential part of the graphic, titled "Opposite Habits of Famous Writers," and you can click here for a link to the full infographic at bid4papers.com. Since so many of you are writers (or aspiring writers) yourselves, I hope you'll enjoy this graphic as much as I did—perhaps while enjoying your morning cup of tea! The next surprise came when I turned to the letters section. I alway like to see whose comment they've featured from their Facebook page, and I must say that this one was rather unexpected! 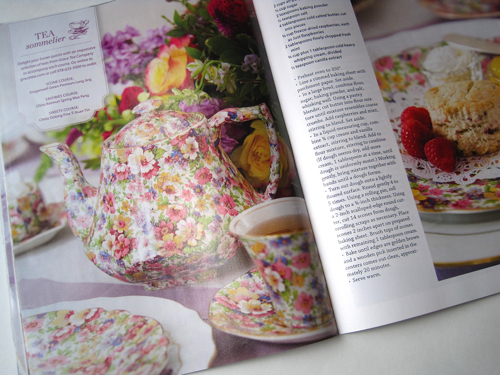 There's much to love in this new issue, but I'm always tickled when I come across some beloved chintz, because chintz teawares are the ones I most associate with spring. 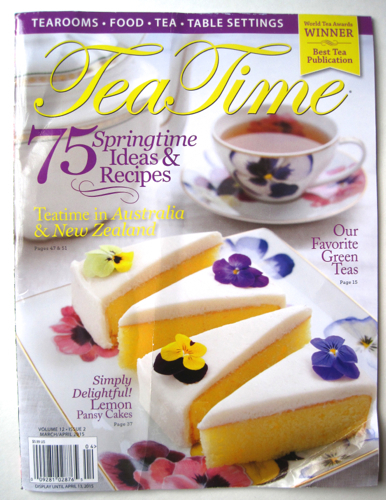 I also like a lot of the recipes in this issue, especially some tiny lemon cheesecakes with candied lemon slices on top. Lemon treats, too, make me think of spring. 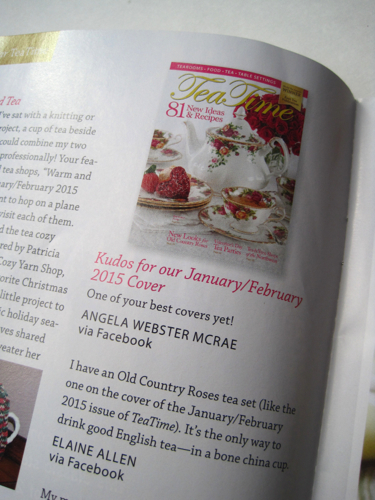 Have you received your new issue of Tea Time yet? If so, what caught your eye? Cynda P.! Congrats! And since I have your e-mail address, I'll be in touch momentarily about getting this off to you! Friday the 13th was not unlucky for me at all, because on that day I got to open this beautiful Valentine package from tea friend Mary Jane in Virginia! 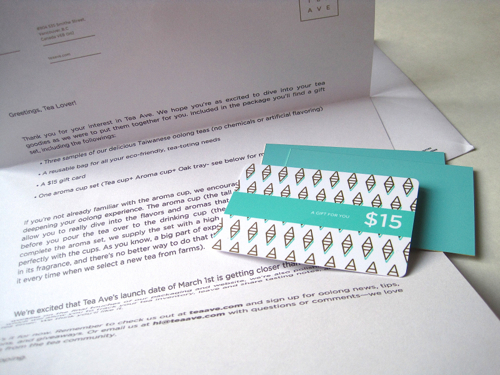 If you're like me, you're smiling before you've even opened the paper on a pretty package like this one. Inside was the most elaborate handmade Valentine I've ever received! 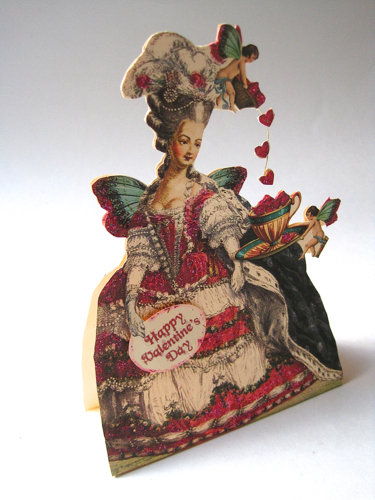 I loved the whimsy of this fanciful lady with little hearts being poured into her teacup. 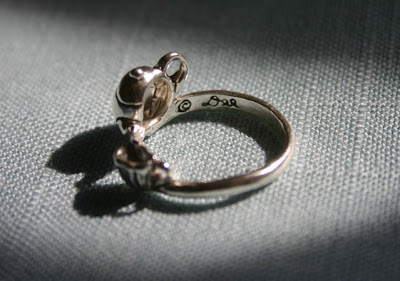 The back looks the same and reads, "I'm pouring you a little cup of love." I can only imagine the time it took to cut out all these little hearts and affix them to the wire so that they appeared to be "floating" into the teacup. 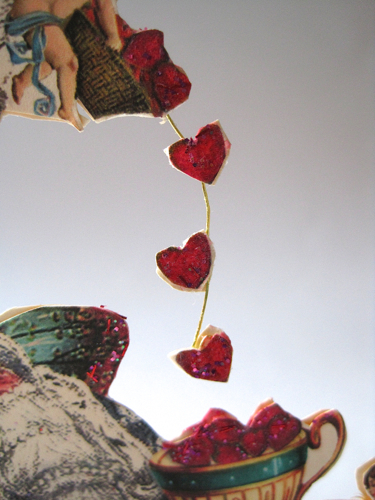 This feature obviously made a great impression on me, as I was dreaming about tiny strands of wire-strung hearts when I woke up on the morning of Valentine's Day! 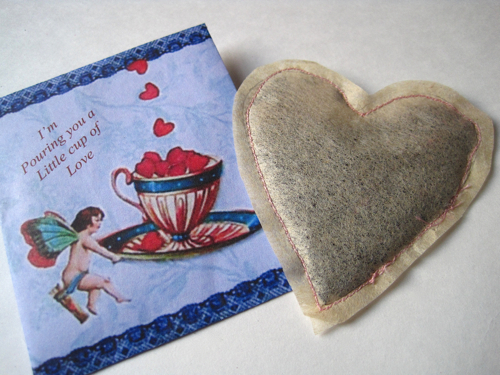 And is if that weren't enough, she apparently hand-stitched these heart-shaped tea bags with yummy rose petal tea inside! Have you ever? I can't imagine going to this much trouble, but oh, was I happy to be the lucky recipient of a gift from someone who did! A tea tasting with the new aroma cup set! Naturally, I was eager to try that new aroma cup set I received from Tea Ave last week, so this weekend I made time to try out one of the new tea samples they sent! The Magnolia Oolong is the one I chose to sample first. 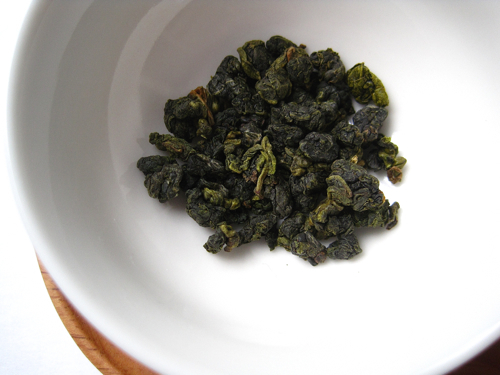 The dry tea leaves were different shades of dark green and were rolled into tight little balls. 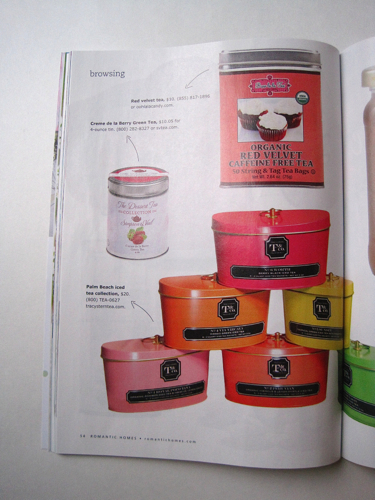 The description says, "Known for its calming qualities, magnolia is a sumptuous, exotic tea, light and pure-tasting. 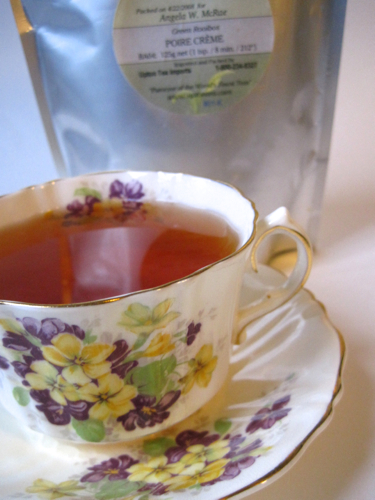 Magnolia is a highly refined tea with an appealing sweet flavor and warm floral notes." I couldn't wait to see if I agreed! The package had very specific instructions on how to brew the tea, depending on whether you're brewing by gaiwan, tea bag, teapot or cold brew method. 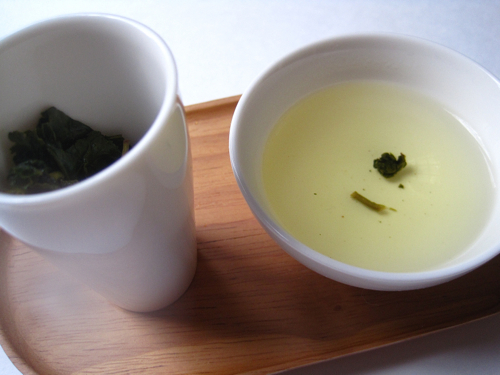 Since I was using this set that is similar to a gaiwan, I used that method and brewed the tea leaves for just 1 minute. 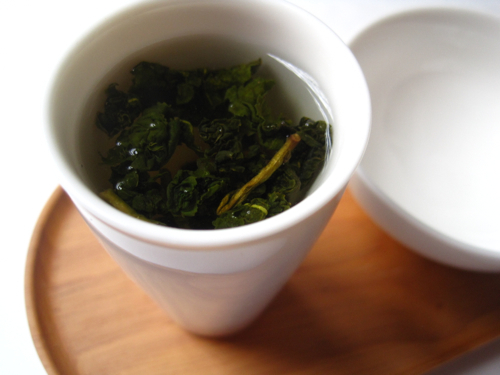 The tall aroma cup (shown here) allows you to fully appreciate the aroma of the tea. While the dry tea leaves had a sweet and almost citrusy scent, the brewed tea had a more vegetal scent but still with that hint of a sweet little something extra. After 1 minute, I poured the tea into the drinking cup (without using a strainer, as you can tell). The flavor of this tea was more complex than I expected, quite a smooth, pleasing oolong with a light aftertaste, no astringency or bitterness, and indeed, that sweet finish they had described. 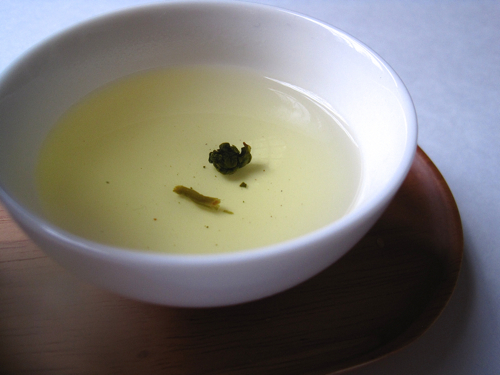 I brewed it again and enjoyed it again, and I definitely am a fan of this Taiwanese oolong. If you missed Saturday's post, be sure and visit it before 7 a.m. EST tomorrow so you can comment and have a chance of winning some oolong samples and one of these wonderful aroma cup sets for yourself! "Andrea in TN," who is a Vols fan! Andrea, if you'll send me your snail mail address via the e-mail button at right, I'll get this mug headed your way. Congrats! Happy Valentine's Day, friends! Today I conclude my week of Valentine's giveaways with my final vintage Valentine of the week, a cute dog-turned-waiter sporting a giant cup of tea overhead. This card is unsigned, but I love it anyway because it's one I've never seen before this year, when I found it on eBay. But today, I'm quite eager to get on to the giveaway, because it's a doozy! Ah, it's a tote bag! Actually, I read the enclosed note and learned they had sent me "two exact gift sets" and said I could share the second set with a fellow tea-lover or in a giveaway. It seemed quite fitting that this rather extravagant gift should be shared with one of you as the grand finale Valentine's giveaway on the blog this year. What's inside? 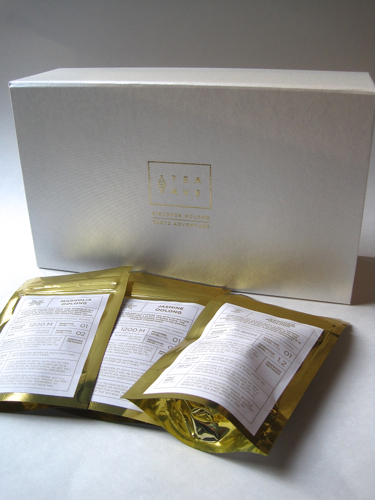 First, there are three packages of oolong tea. 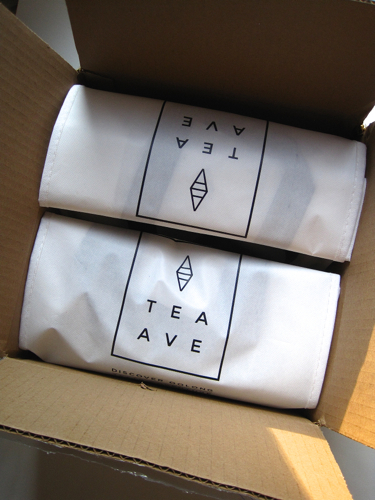 I like that you can see the tea leaves through the package! 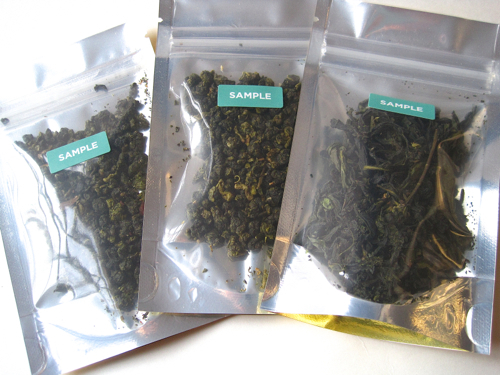 These Taiwanese oolong samples include Magnolia Oolong, Jasmine Oolong and Wenshan Baochong Oolong. But what's in that nice box behind the samples? Are you just dying to open it? I was! 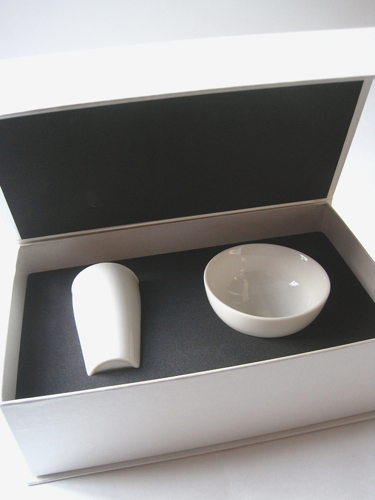 So, I read the letter that Tea Ave included with the goodies and learned this is actually called an "aroma cup set," and there are instructions on how to use it. I haven't had time to test drive mine yet, but I will do so in the next couple of days, Lord willing, and report back to you! "But wait," as they say on the TV commercials. "There's more!" The winner also gets a $15 gift card to use on the teaave.com website once it opens for business. Now, how special is that? I am so thrilled with my lovely gift from Tea Ave, but I am even more thrilled that I get to share the love with one of you here on Valentine's Day! This is such a special gift, I'm going to let this giveaway run through Tuesday morning, February 17, to give everyone plenty of time to enter. All you have to do is simply leave an "Enter me" comment to this post between now and 7 a.m. EST February 17. (U.S. residents only.) As always, please make sure I have a way to identify you or get in touch with you if you're the winner! 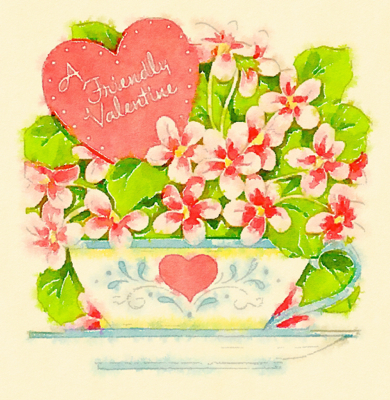 I've greatly enjoyed celebrating Valentine's Week with you all, and I'm grateful Tea Ave had such awesome timing in sharing these terrific gift bags of tea treats! Elizabeth Pinson’s third graders couldn’t wait for their Valentine’s Day party to begin on that Thursday in 1952. The children had been preparing for more than a week. They’d colored dozens of hearts and paper lace doilies to adorn the walls. Most of the hearts were pink and red, but Timmy Wilson colored his green. Timmy never did like to play by the rules. Room mothers had dropped by all week, asking Miss Pinson if she needed help with the party and whether she had enough treats promised. As always, there would be plenty with enough left over to feed another classroom or two. So far, the mothers were bringing iced sugar cookies, brownies, potato chips, peanuts, pimiento cheese finger sandwiches, and a sheet cake from Butterfield’s Grocery Store. Lucy Butterfield was in the class this year, and Mrs. Butterfield donated fancy sheet cakes from her husband’s store at every opportunity. On Wednesday, the children had decorated paper bags to hold their Valentines. While Miss Pinson usually tried to see that the bags looked similar, this year she let the children decorate the bags however they liked. She’d read an article about the importance of letting students show their individuality. The girls drew hearts and flowers on theirs, and some of the boys took the liberty of drawing their favorite cartoon characters, including Howdy Doody and Joe Palooka. Miss Pinson hoped the day would be fun, but mostly she hoped that the handsome new P.E. teacher, Walter Elliott, would pay her a visit. He’d been dropping by a lot lately to deliver messages from the office or ask her opinion about a student. Was it just her imagination or was Walter angling for a date? At 23, Miss Pinson was starting to feel like a spinster. Secretly, she hoped for a little male attention this Valentine’s Day. 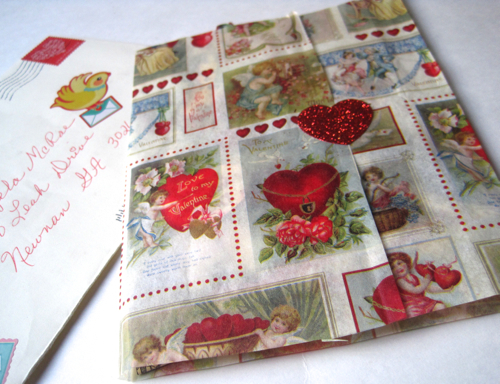 The children had placed Valentine cards in their paper bags first thing that morning. After lunch, it was time to open them all. There were loads of Valentines. Miss Pinson always purchased extras to make sure no child was left out. Some, she signed “Your Secret Admirer” or “Guess who?” The children always loved thinking they had a secret admirer. A few boys said “Yuck!” when they opened those cards, but then Miss Pinson would see them looking around the classroom as if trying to guess the identity of the secret admirer. The hour for the party arrived, and the treats poured in. The Butterfield sheet cake was a pink and red masterpiece. Thick strands of red icing spelled “Happy Valentine’s Day,” and pink shell-shaped icing trimmed the borders of the cake. Miss Pinson was glad the party was held near the end of the school day. These children would be buzzing with sugar before the afternoon was over. She planned to take a piece of cake home with her for her afternoon teatime. Miss Pinson loved tea, something all the children knew about her. She even kept a pretty pink teacup on her desk. It held the stray pencil erasers and marbles she often picked up after class. As room mothers hovered near the food table, there was a knock at the door. Miss Pinson asked Timmy to answer it. “It’s Mr. Elliott,” he said. “Hi, Walter,” she said, lowering her voice so the children wouldn’t hear her addressing him by his first name. “That’s thoughtful of you, Walter,” she said. “I’d love to,” she said, smiling. A tug at her skirt from Timmy brought her back to reality. He nodded at the tall woman beside him. “Miss Pinson, the children want you to open your gift from the class now,” said one of the room mothers volunteering at the party. “Of course. I’ll be right there,” she said. In the classroom, the room mothers whispered. Miss Pinson could tell they were eager to watch her open a special gift from the class. “I know what it is,” teased Lucy Butterfield. 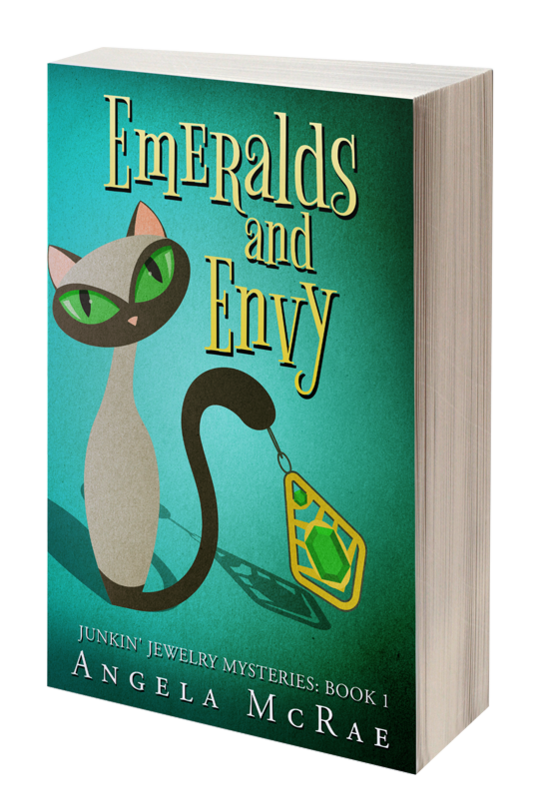 “Well, I don’t,” Miss Pinson said, grinning as she tore into the gaily wrapped package. 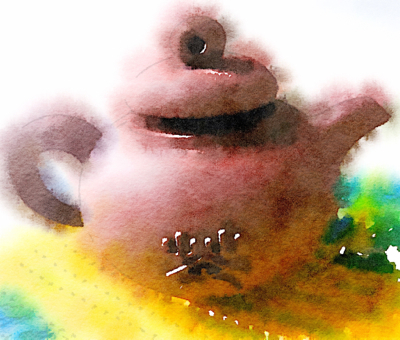 She opened the box and pulled out a beautiful pink teapot that exactly matched the teacup on her desk. “I love it,” she said, holding it up for the class to admire. She thanked everyone profusely before the mothers and students headed off, the party over. Most of the students had gone home for the day when, around three thirty, Timmy Wilson walked up to her desk. “I forgot to give you this,” he said, handing her a small white envelope and quickly scooting off. “Thanks, Timmy,” she called out, hoping he’d heard her. She opened the envelope and pulled out one of the loveliest Valentines she had ever received. It showed a bouquet of flowers in a teacup with a heart on it. “A Friendly Valentine,” it read. Inside it said simply, "Love, Timmy." She had received a surprise box of chocolates from Walter and now a surprise Valentine from Timmy. Miss Pinson couldn’t help thinking that Cupid had been very, very good to her that year. With a small slice of Butterfield sheet cake wrapped in foil and tucked carefully in her pocketbook, Miss Pinson turned out the classroom light and headed home. It was almost time for tea. Catching up on "Christmas" with a tea friend!